The preparation for writing a dissertation primarily involves reading and synthesis. Once the topic is chosen (in my case, the fiction of Peter Ackroyd and the politics of literary postmodernism/historiographic metafiction), the anxious doctoral candidate understands that they must become conversant in their field—being required, at some point, to publicly defend their dissertation in order to be granted the degree, and understanding as well that the focus of their study will likely be the field area they'll be highlighting when they land (or try to land) a job. Since I was investigating historical fiction, I read about the various controversies that have dogged the genre since its inception. And one that has stuck in my head took place in Europe in the 1830s. A literary critic, let's call him Z, called for the passing of legislation regarding historical novels. In his (unrealized) dream, a historical novelist would be required to distinguish which part of the novel was historically actual from parts of pure invention. Z's worry was that any reader of historical fiction would be duped: the novel, posing as a mode of historical writing and knowledge, would trick the reader into believing falsehood as fact. Z foresaw clear trouble with the proliferation of historical novels. Even though the reader knows the historical novel is fiction, the historical novel form, which cleverly mixes together the real and the imaginary—here's a fake historical novel example: Marie Curie née Sklodowska is born in Warsaw in November of 1867 (fact); her aged nurse, Minnie Castevet, feeds the infant tannis root when Ma and Pa Sklodowska are out of sight because Marie is Satan's spawn (um, fiction, adapted from Rosemary's Baby)—and therefore there's no way for the average reader to tell one from the other, especially because the inventions are typically reasonable or probable instead of outrageous or clearly fantastic. The result? Due to the seductive properties of a novelist's storytelling, readers come to accept a 'fact' that is nothing other than a novelist's fancy. For Z, the impact would be dire: an ignorant populace that doesn't really know the difference between what happened, what might have happened, and what did not happen. Egad, call the lawmakers! The memory of Z's call for governmental intervention surfaced when I was reading Richard Wagamese's Indian Horse. The novel is set in the mid-1980s and is narrated by Saul Indian Horse; Saul's in rehab facing his alcoholism and its causes. Encouraged by a counselor to peer into his past, Saul reluctantly obliges. The recollections are harrowing: his family is torn apart; he's forced into a residential 'school' that is closer in spirit to a POW facility; and once he leaves the school and travels the country, he encounters a Canada densely populated with hateful racists who seemingly want nothing except for him and his people to die and disappear. Wagamese's vision of Canada was disturbing, not least because it made me question the difference between the national narrative and truth. Indian Horse also raises a question (it's a long question, sorry): When the culturally-sanctioned 'story of Canada' is one of evolving multiculturalism and 'things getting better' (with blemishes on the story like residential schools or war-time internment camps being distant mistakes accompanied with formal governmental apologies and rhetoric about 'bad old days' and 'lessons learned' and 'never again') collides with Wagamese's story of a nation circa 1960-1980 that does not have pockets of racism but is rather populated by a white population that's unified by its explicit racism, how do we (readers who can view these stories side by side) locate the truth? In George and Rue, George Elliott Clarke's account of the lives (and executions) of two of his relatives, Clarke envisions Nova Scotia and New Brunswick in the 1930s and '40s as oppressively racist; white individuals freely and frequently express anti-Black sentiments, and the bias of institutions (from schooling to hiring practices) likewise assures the continued existence of an egregiously out-of-balance society. Based on "bleakly truthful circumstances," the novel blends together research material like trial transcripts and newspaper reportage with "fiction": Clarke writes, "I have taken prodigious and relentless liberties with 'facts,' so that the psychologies, identities, genealogies, and even some place descriptions are purely imaginary." In doing so, Clarke contextualizes the murder that George and Rue commit (declaring, "I also believe that their being closed off from opportunities served to create the conditions for the violence they enacted as well as the violence from which they suffered") for at least one clearly political goal: "But as an artist, as a Black Canadian artist, I had to relate this story that tells a true history of Canada—not the propagandistic, rose-coloured-glasses version." For readers, part of the puzzle of George and Rue is determining the differences between fact and "fact" and fiction. And in thinking about Clarke's act of correction: countering a "propagandistic, rose-coloured-glasses version" of history with a "non-fiction novel" that takes "prodigious and relentless liberties with 'facts'" in order to tell "a true history of Canada." Wagamese's book comes with no annotation about its goals or its method. 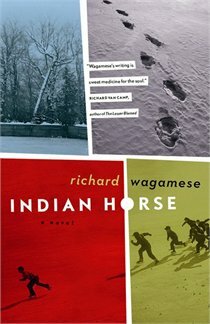 Yet in telling of one Ojibway man's experience in Canada in the recent past (the narrator's flashbacks begin in 1961, when he was eight years old), Indian Horse aligns with Clarke's inasmuch as Wagamese presents a radically different version of the Canadian history that many take as a given. It's historical fiction as intervention, and asks—or challenges, depending on your investment in a certain Canadian historical narrative—that you reconsider what you think you know and rely on a work of fiction as the basis for your decision. I used to teach Bharati Mukherjee's essay "An Invisible Woman," which first appeared in a Canadian magazine in 1981. In the essay, Mukherjee's living in New York City, to her a metropolis that's emblematic of the United States—"violent, mindlessly macho, conformist, lawless." And though she's been attacked and robbed (twice) and defrauded over a short period of months, she's thrilled to be far away from coldhearted Canada. Mukherjee's view of Canada is condemnatory: "I have not met an Indian in Canada who has not suffered the humiliations of being overlooked (in jobs, in queues, in deserved recognition) and from being singled out (in hotels, department stories, on the street, and at customs)." She'd moved to Canada imagining it would be "a kind of haven" after "the unsophisticated, beer-swilling rednecks of Iowa," but instead found a country that time and again politely denied its racism, sanctimonious in (but in fact delusional about) its colour-blindness. Most of the students assigned to read the essay (who were, incidentally, born after Mukherjee's essay appeared) said they "couldn't relate" to Mukherjee's experiences. They were comfortable disagreeing with her on two counts: 1: Canada is clearly "less racist" than the USA; 2: Mukherjee's view may have been valid "back then," but it is seriously out of date. The students claimed they were not blind to or naive about racism; still, they believed it was now isolated, not systemic nor widespread. For them, Mukherjee's essay was a historical curiosity that spoke not only about another time but in a sense another place. Their points of view suggest either the validity of the 'things are better' national narrative, or else the pernicious influence of what Clarke calls the "rose-coloured glasses" story, a historical narrative that's designed, I assume, to encourage mainstream Canadians to pat themselves on the back.